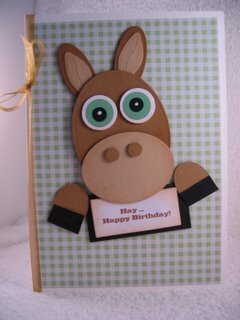 A cute Horse card to make. Have you got lots of left over bits of card from other projects? Put them all to good use and make some Novelty Cards with the bits that you have. There are lots of different ideas for you to try in that section and I hope you enjoy them. They are ideas that are suitable for boys or girls, and they are sure to please. 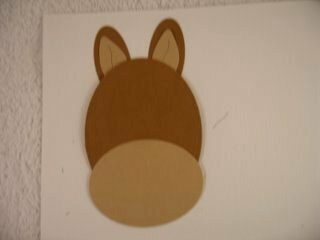 I have used two shades of brown card for my horse and cut out ovals and circles. 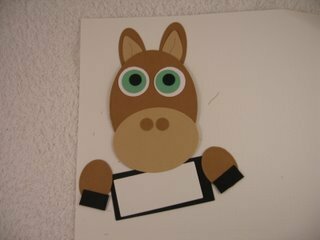 There are also two long oblongs to add the sentiment too, and some spare black card for the hooves. Ink all the edges with a Blending Tool. 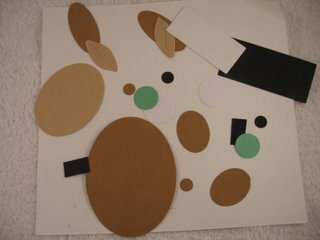 Cut two small ovals in each of the two shades of brown and make one slightly smaller than the other to be the inner ears. On the top of these add the main part of the horses head which is the largest oval. I used foam pads to raise it up a little from the ears. Add the smaller oval to the bottom of the face at a different angle, to be the muzzle of your horse. Into this add two smaller dots to be the nostrils. 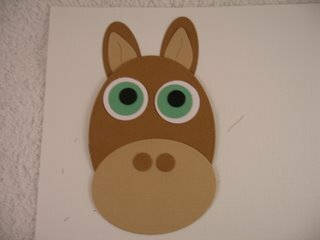 Punch out two white circles for the eyes, and two more in the color you want the horses eyes to be. Cut two black cicles, and into these add two white dots to give the eyes expression. 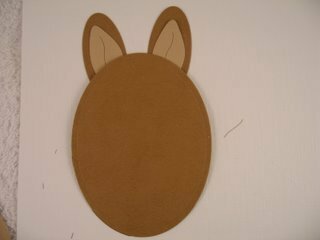 Add two smaller ovals for the legs, and to the bottom of these cut two pieces of black card to be the hooves. Add the panel between the hooves, and computer generate your sentiment. And to finish the card add some backing paper and a ribbon, or any other embellishments that you have and have fun.